Unlimited Free SSL Certificates for Life! Why Mocha Web Hosting? Since 2002, we proudly provide Unlimited Web Hosting backed by 100% uptime guarantee, 24x7x365 savvy tech support, ultra fast green servers, lifetime free domain name, easy website builder, and 180+ ready-to-use apps! Learn more..
How do we compare with the rest? 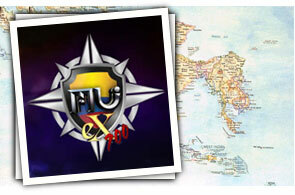 We accept: Visa/MasterCard/American Express/Discover, PayPal, Skrill, MoneyGram, check, money order, bank transfer. We are the only company that offers you a Discount for Life! Your plan renewal fee will be the same as your initial plan price! We make sure that you enjoy the low prices as long as you stay with us. No hidden fees, no price changes. Click here for the details. 180 Days Risk Free Guarantee! We have a 180 DAYS RISK FREE guarantee on ALL shared, reseller & VPS plans. There is no risk for you to sign up and try our great service! Click here for the details. We have 24/7 technical support, interactive step-by-step tutorials, and an extensive knowledge-base area. We can even provide you with assistance in transferring your site to us when needed. Our Business & Mocha plans include a FREE Website Builder with 500+ professional templates, or you have the option to sign up for one of our custom design packages. We offer a free Top Level (com/org/net/info) Domain name as long as you host with us. Click here for the details. Free Unlimited SSL Certificates for Life! We offer free Unlimited Sites/Domains SSL (256 bit) certificates increasing your search engine visibility by complying with the new Google ranking algorithm. More info..
With each package we offer FREE search engine submission ($50 value), and FREE SEO consultation ($200 value). We also offer FREE powerful SEO tools through selected packages. All of our plans are e-Commerce ready, and come with a FREE shopping cart (Presta Shop,Open Cart, Magento, ZenCart, CubeCart, oscommerce, and more). We also offer merchant services with discounted rates, and special promotions on SSL certificates. We Are Great For Bloggers! Blogging platforms such as WordPress, Blogger, BlogEngine.net can be installed through most of our plans with 2 mouse clicks! 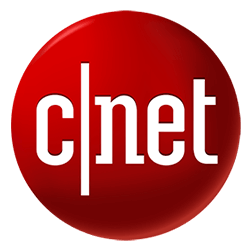 We have received numerous awards for performance, and client satisfaction, as well as recognition from names such as CNET, HostReview.net, Top11Hosting.com, etc. Check here for more details. We Have Plenty Of Happy Customers! We offer consulting, custom application development, custom design, merchant, & Internet marketing services. We can provide you with professional assistance - when you need it. Referral Program - Earn up to $2,500 per sale! You can earn up to $2,500 per sale when you refer potential clients to us via our Affiliate Program. The more clients you refer to us, more cash you make! We will give you a discount, or even provide you with a month of FREE service, if we fail to meet our guarantee. Click here for the details. All of our nodes are equipped with the latest & fastest Intel/AMD enterprise processors, 256GB+ of RAM, allowing for plenty of resources for all clients hosted. Protected by CISCO, and application firewalls we offer better security, and protection for common attacks. Our data centers (SAS 70 Type II certified) with industry leading N+2 redundancy are equipped with multiple backbone Internet lines, backup power diesel generators, backup tape libraries, 24/7 surveillance ensuring speed, safety, and redundancy. We monitor our servers 24/7, using the latest technologies available, and apply strict security policies to make sure that your information is always available to you and your clients while maintaining safety and confidentiality. For optimum performance all of our enterprise level SAN storage servers utilize state of the art SSD caching technology, backed up by redundant RAID 10 (best performance) topology. All of our servers are highly available, and equipped with 100% redundant components! Unlike some of our competitors we never use cheap, unreliable, or non-enterprise hard drives. You can host unlimited sites, and parked domains with most of our packages. We also offer a Reseller program with support for unlimited sites! Our servers are custom built for maximum energy efficiency, producing a minimal amount of carbon emissions. Check here for more details. We stay on top of the latest technologies, and provide support for applications such as: PHP 7/5, ASP.NET, Python, Perl, MySQL 5, MS SQL, MS Access, Ruby on Rails, and JSP. We offer both Linux, and Microsoft Windows shared web hosting plans. In addition if you outgrow your hosting needs - we offer VPS, and Dedicated Cloud servers and custom business solutions which will take your business to the next level. We offer the cheapest domain registration, and domain renewal fees for .com/org/net domains, as well as for over 100 other country wide domain extensions. All of our plans include a free Google AdWords credit (up to $100) For more info click here. All of our clients have access to a state-of-the-art email marketing platform including easy to use newsletter module. Click here for the details. SSD Technology ? Enterprise SSD Storage ? All prices (USD), features, and plans listed were taken from the public sites of the companies above as were available on April 3rd, 2019. Prices, and features may change without a notice. 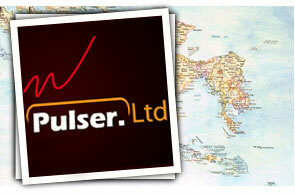 All company names are trandemarks of their respective owners. I've been with MochaHost for more than 6 months, what I like the most is the fast, and reliable support offered - right from the start. Now I have a VPS plan, what a great server! I Hope my company grows using MochaHost, thanks! 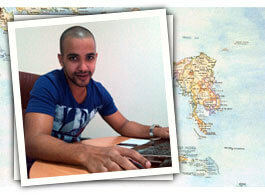 Hello from Edson, Web Business Manager at cabosys.cv! To interact with Mochahost is always a pleasure! At the start of our business we were with another host and after less than 6 months we had to quit, due to many issues. Luckily we found Mocha. We were concerned about what would it be like, but we experienced something amazing: another level of Support (never had an issue to solve that took more than 24 h), modern tools, up-to-date servers, resources that brought our business plan to life. Now we feel like part of MochaHost. My colleagues and I want to say 'Thank you MochaHost for all these years!'. We are looking forward to many more years of business with such a reliable company. We have tried more than 5 hosting companies around the World, including Asia, America, and even local service here at Taiwan. MochaHost is by far the best hosting service we have encountered. Friendly control panel, fast response, unlimited space. We can't believe that we can find such good service, on such good price! Thanks MochaHost, we plan on using your service for years to come. * 1 free domain special applies with 1 and 2 yrs commitment. NOTE: Our 3 year plans do NOT come with free domain. For more info check our Specials page. *** Free Static IP special applies for Mocha plan with 1, 2 and 3 yrs commitment. With our Advanced PHP Selector tool (available to all of our Linux Shared Accounts), every client is able to easily select a PHP version of choice, in addition to able to manage all PHP extensions, and basic PHP configuration options (php.ini changes). Say no to the messy configuration changes, and hands on dirty work! 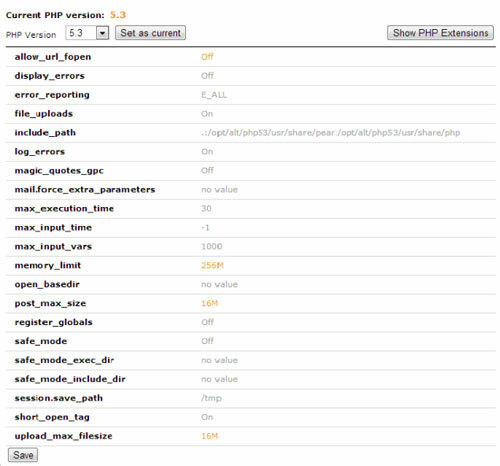 The Advanced PHP Selector is available directly in our cPanel control panel, screen-shots of which are available below. Once inside the tool, the first screen displays the current PHP version, which by default is listed as "native" (which is usually the most current/most popular PHP version). Once the desired PHP version is selected, you will be able to pick any required for your applications PHP extensions. If you are unsure which extensions to select, we recommend that you check with your application developer/vendor, or leave the default set of extensions. Once you are done selecting your PHP extensions, simply click on the button "Save" at the bottom of the screen. Once you are done selecting your PHP configuration options, simply click on the button "Save" at the bottom of the screen. It is important to be noted, that depending on the PHP version selected, different PHP configuration options will be available. For example "magic_quotes_gpc" will not be available for PHP 5.4/5.5/5.6 since it is removed as a feature from the latest PHP builds. Below is a link of the standard cPanel interface provided by cPanel directly for demo purposes only. Also, the demo by default is in English, our custom cPanel interface supports many languages, included with all of our web hosting plans. You can change the language once you access the demo.